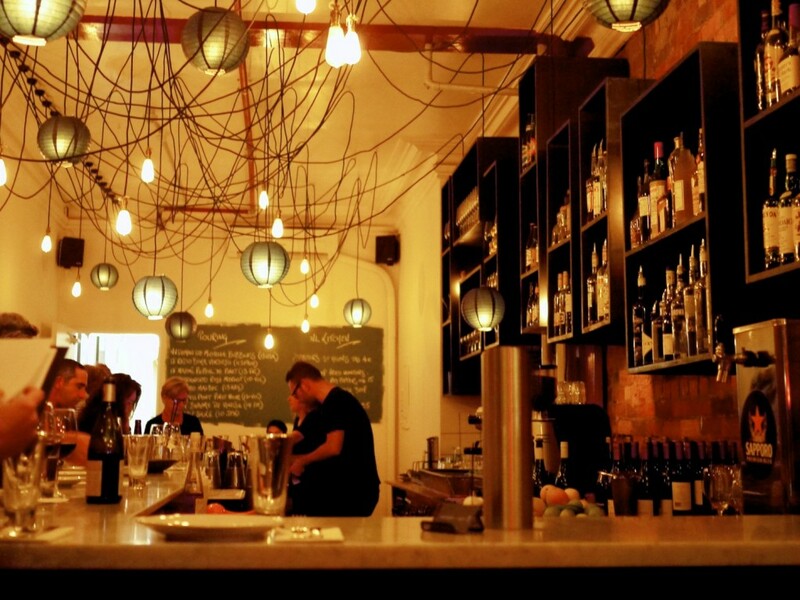 Smith Street has come such a long way from its shady days, transforming into a well known culinary strip it is today with the likes of Saint Crispin and Huxtaburger to name but a few. With exposed brick walls and a bar counter dominating the dining room, Adam Liston’s Northern Light may appear at first glance to be yet another casual eatery that seems to have dominated the dining scene on the street. Once inside, however, you quickly realise that they mean serious business when it comes to food. The food here could perhaps simply be termed fusion, but not of the typical west-meets-east type which has been done to death. Rather, a Sino-Japanese fusion which was riddled with so many familiar favourite flavours: something I’ve never seen all bundled on one menu. Personally, I wanted to eat everything on the menu. It was as if someone had taken all the delicious things from across the region and placed them in front of me. There was an option for a 6 or 8 course banquet menu but given we were three people we thought we’d be better off trying more dishes. A wise choice, although with the beauty of hindsight, we ordered way too much. 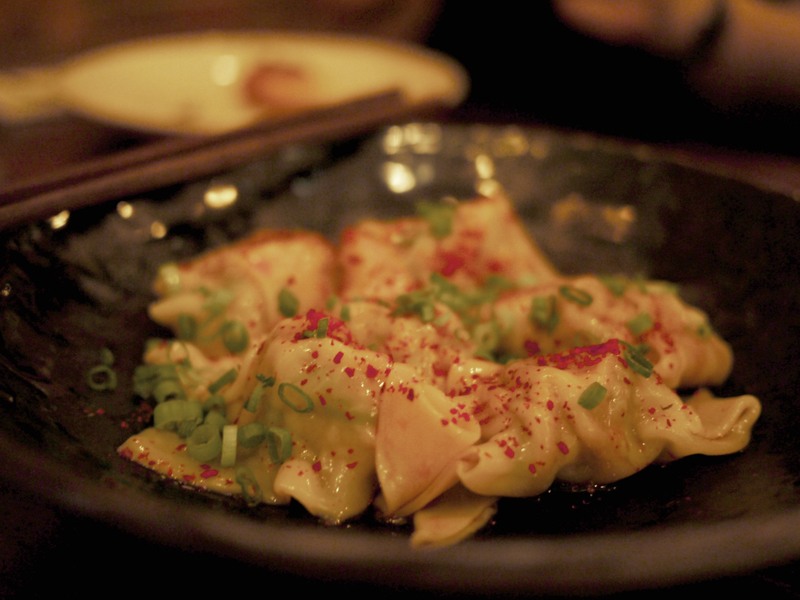 For snacks, we started with a typical Japanese Izakaya appetiser of the Charred Shishito peppers and tōgarashi. 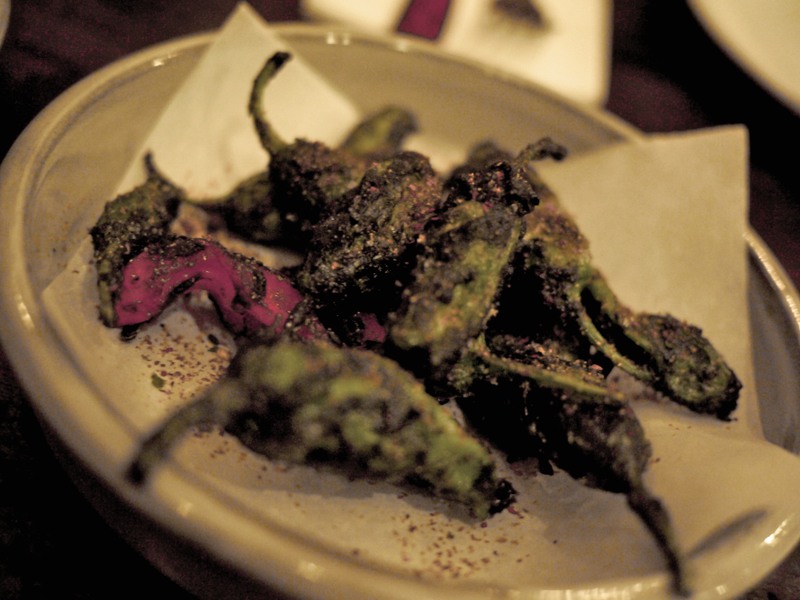 Shishito essentially is a mild-sweet Japanese capsicum varietal which tastes delicious when charred. 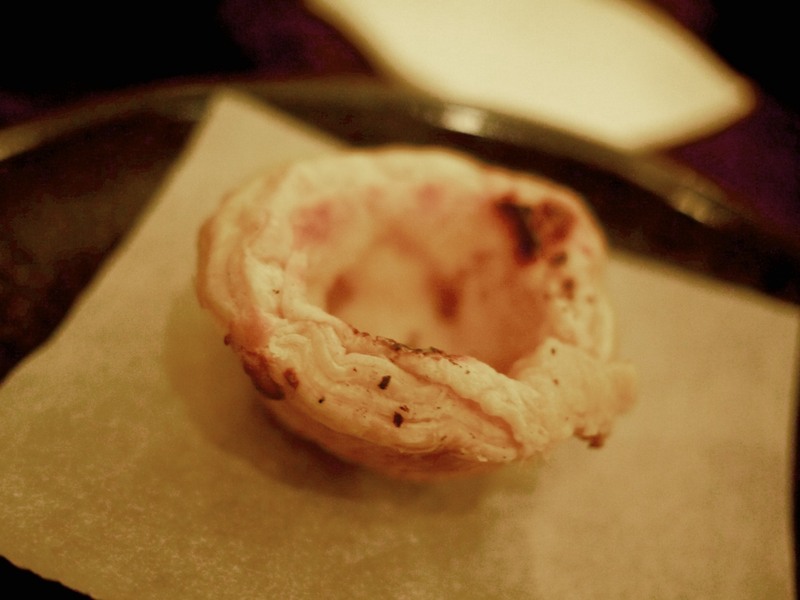 It was dusted with tōgarashi, a Japanese seven spice, for an extra kick of heat. 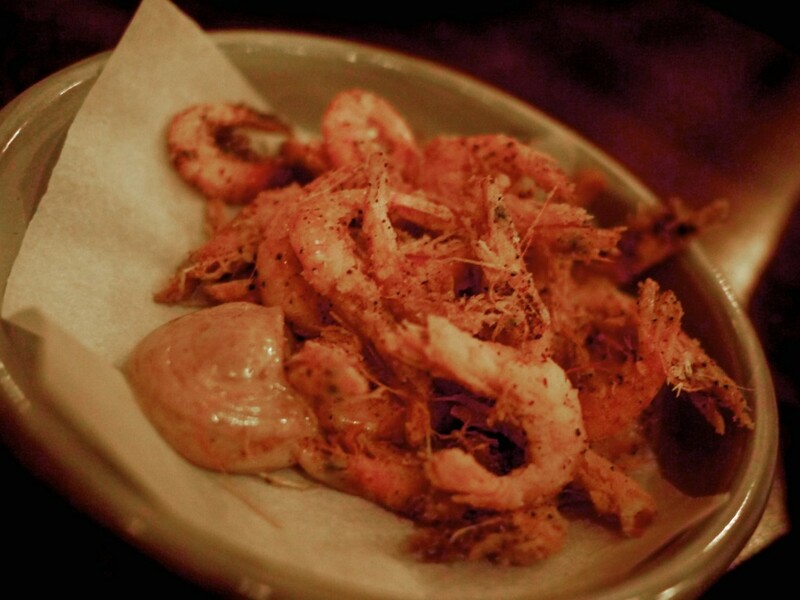 Our second installment was the Sichuan spiced school prawns and curry mayo. The entirely edible juicy prawn, covered in a thin layer of crispy batter, had fortunately a mild heat to suit the local palate. The prawns were good enough on their own but the curry mayo added a new and welcome flavour dimension to the dish. 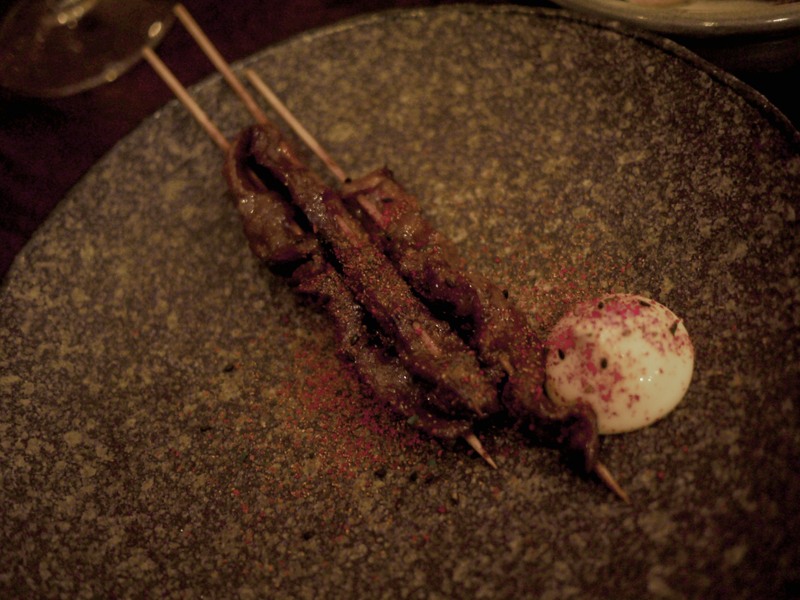 The Wagyu oyster blade skewers and Bulldog sauce was cooked over binchōtan, a traditional Japanese white charcoal which emits far less smoke than other charcoal cookers, allowing one to appreciate the clean flavours of the skewer of choice. To my surprise, the common Japanese household sauce normally used for tonkatsu went extremely well as a marinade. Most importantly, the meat was moist and tender. 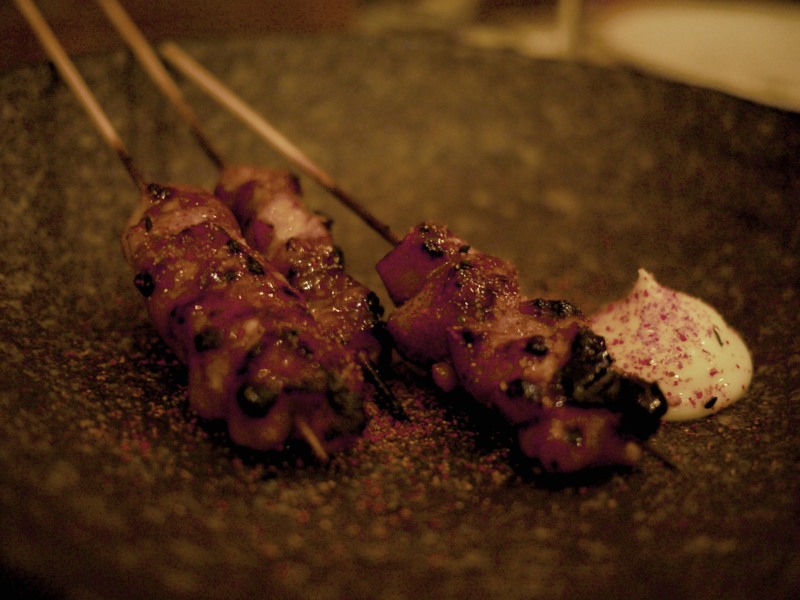 The Chicken skewers, honey and katsuo soy was the unanimous favourite amongst the two types we ordered. The honey glazing added a beautiful sweetness to the moist chicken and was much more meatier of the two. 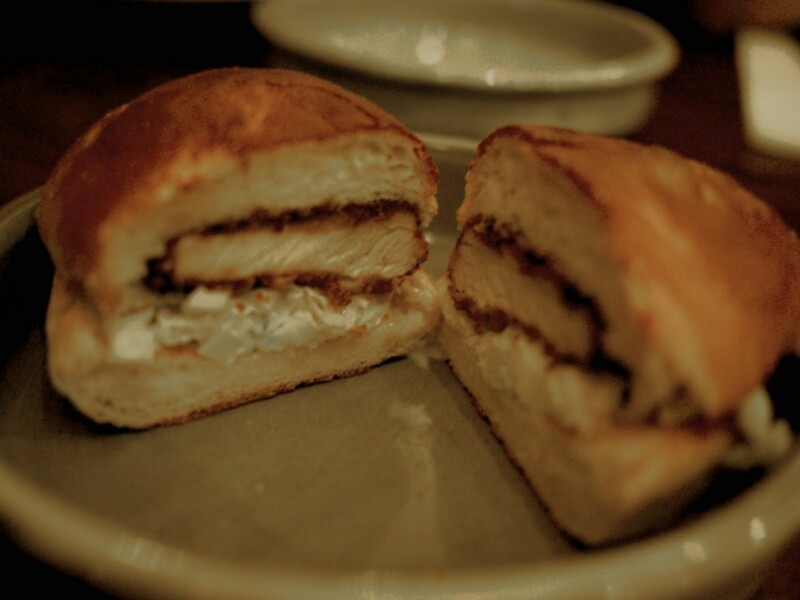 The Pork tonkatsu roll, cabbage and grilled milk bun was decent but perhaps the least interesting dish of the evening. I could appreciate the crispiness of the deep fried batter and the sweetness of the milk bun but I found the meat rather dry and lacking seasoning. On to our first starter of the Pork and prawn wontons, black vinegar and red pepper oil which hit the mark. The boiled wontons had the hallmark of excellence; thin silky skins, stuffed full with a juicy pork and prawn mixture, bursting with flavour and juice as you bit into it. Wow. 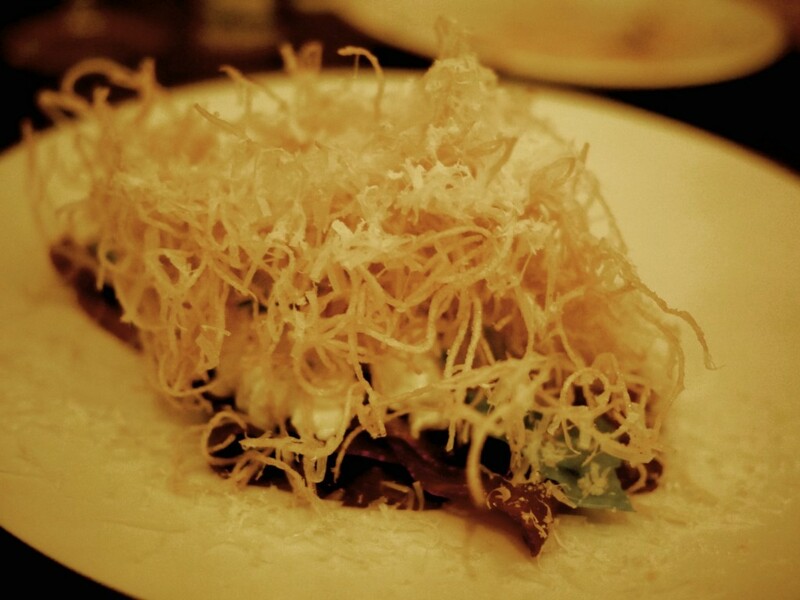 One of Liston’s signature dish was the Air dried Blackmore beef, wasabi, yolk and fried potato and I could see why. The crispy potato-chip topping the slightly salty bresaola-like blackmore beef soaked up the runny yolk and the freshly grated wasabi provided a slight kick to cut through the rich flavours. 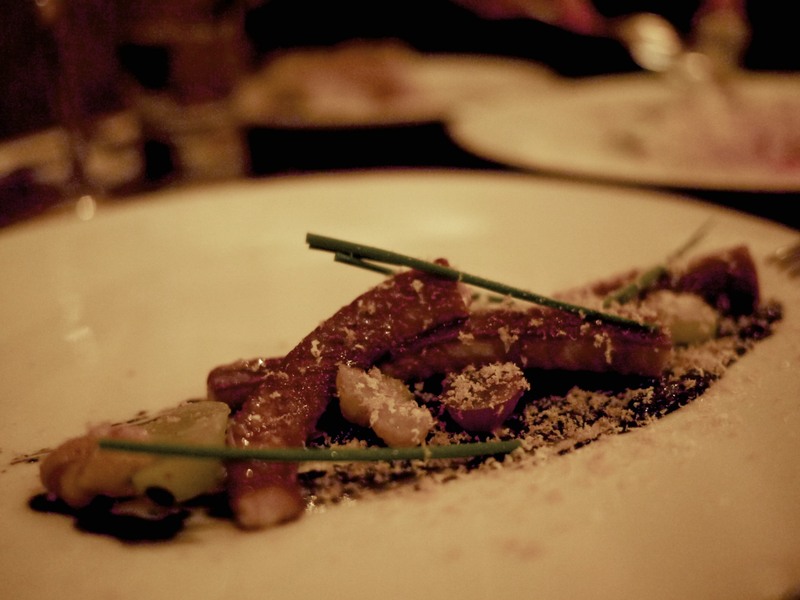 Our last starter was a rather delicate Eel (unagi), squid sauce, salted grapers and mojama. The eel had been prepared in traditional kabayaki sauce and was served over a bed of squid ink sauce. Being a huge fan of the traditional Japanese unagi which inspired this dish, I must confess I thought they could have been more generous with the application of the kabayaki sauce. At this point we realised we had ordered far too many. 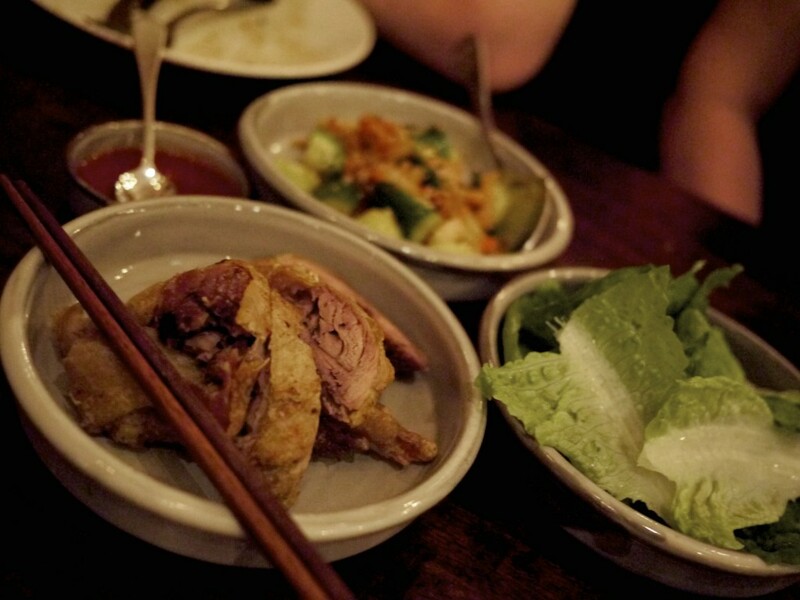 As the waitress came to replace our empty plates with the Korean influenced Bo ssam, our kimchi, lettuce, red pepper jang and duck, she did remark on our amazing appetite. The choice of meat in this case was duck and it went ever so well wrapped in lettuce leaves and home made kimchi with a dab of the spicy-sweet gochujang (red pepper paste sauce). 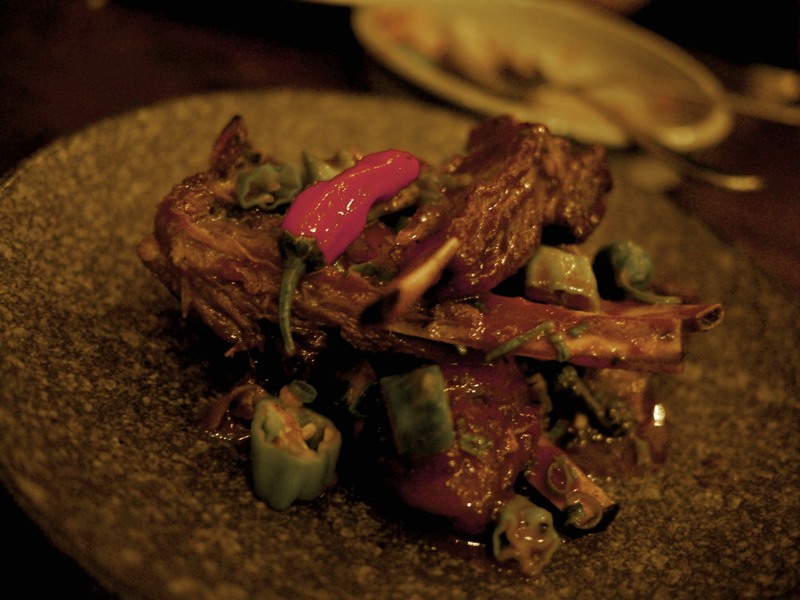 We were absolutely stuffed to the brim but were gripped with the inviting smell emanating from the Xinjiang style lamb ribs and bbq peppers. The braised and rendered lamb in Xinjiang style (similar to the spicy Sichuan style containing Sichuan peppers) had a decent level of heat but most importantly a balance of spice. The meat fell apart with ease from the bone and it reminded me of the ones I had tried in Beijing back in 2012 over a few glass of baiju, a ridiculously strong Chinese liquor. 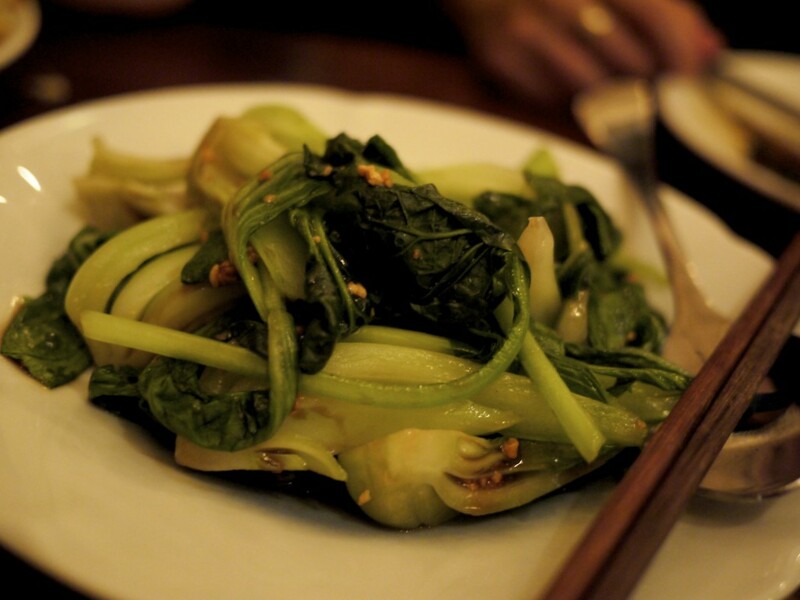 Some Asian greens, vegetarian oyster sauce and toasted garlic to go with our mains. We were absolutely stuffed but could not turn down the offer of trying at least one dessert so we opted for the Broken ice cream sandwich which had vanilla parfait, mousse and salted caramel lurking sweetly beneath a structure of broken chocolate biscuits. 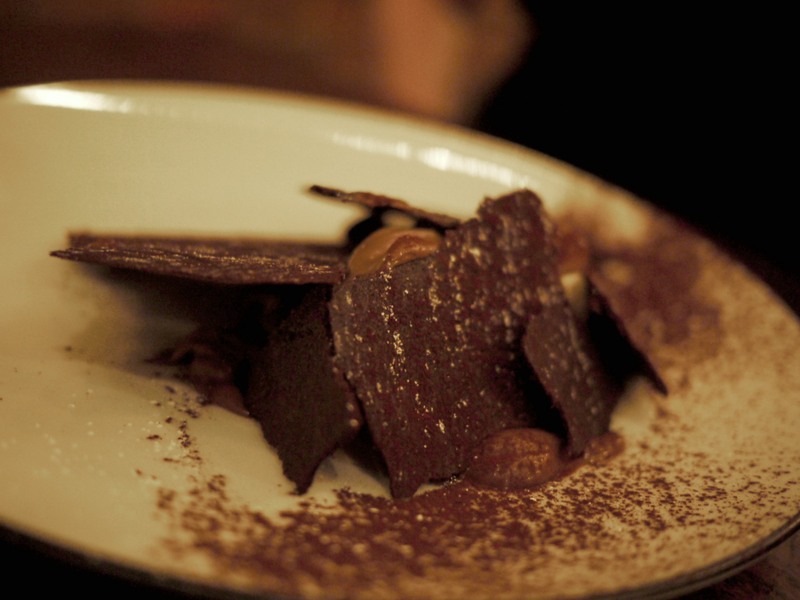 The fine chocolate biscuit with a ridiculously thin layer of wafer was my favourite component, providing a surprising crisp and crunchy texture to go with the gooey salted caramel. And lastly a Warm yamazaki whiskey custard tart that had been caramelised using the binchōtan. As an enthusiast for top quality single malts, I thought this was a bit sacrilegious but the slight hint of whiskey in the custard tart really worked well. 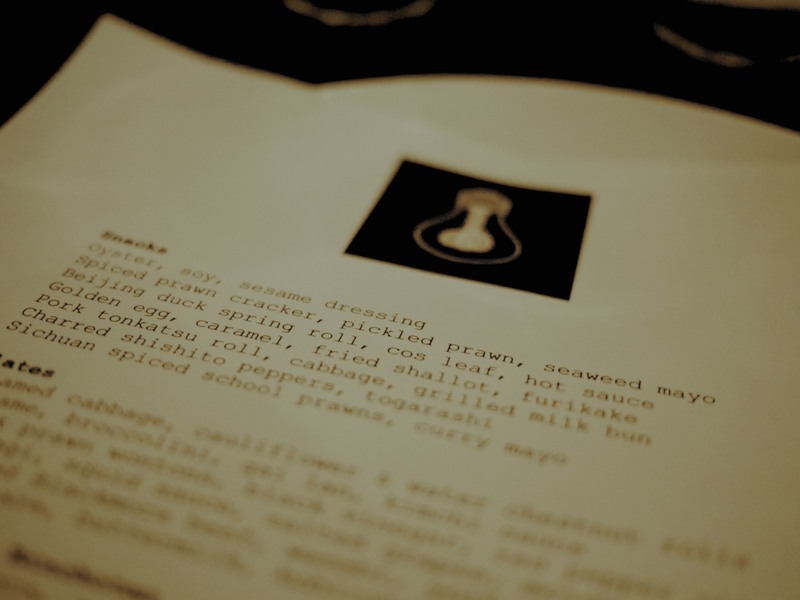 Northern Light had everything we wanted for a relaxed meal catching up with our friend; a little bit of tongue and cheek and banter from the waitress, delicious food with bold and punchy flavours and all priced extremely well. This was exactly the type of fusion food I welcomed with open arms. It was a collection of great food memories I had over the course of my life across Asia all reliving in one evening, triggering different memories from the flavours. Above all, Liston did justice to all these dishes. They were not bastardised Western takes on Asian flavour. This is the real stuff. This entry was posted in Australia and tagged Adam Liston, Asian Fusion, Chinese, Japanese, Korean, Melbourne, Northern Light on May 18, 2014 by admin.